Adam Buchwald is a luthier. He makes mandolins and guitars for a living in his garage on Burlington’s South Prospect Street. For the most part, his neighbors say they have no problem with the craftsman living and working nearby. But one — Barbara Headrick, who resides next door — has invested untold hours and resources in an attempt to shut him down. Buchwald’s goal is to be able to make instruments in his own home. Instead, he’s involved in a protracted legal dispute that began a year and a half ago in city hall and has now made its way into the courts. A request for the case file at Burlington City Hall yields a hefty stack of documents, including correspondence dating back to July 2012. By now, anyone in Vermont hoping to erect a wind turbine, build a Walmart or open a methadone clinic knows to expect governmental hurdles and not-in-my-backyard opposition. But smaller disputes inspire no less passion — and can take just as long to resolve. “What’s so frustrating is that one person can drag something like this on forever and ever, and it could actually get to the Vermont Supreme Court and by law they have to take the case — and that just boggles my mind,” Buchwald said. Headrick counters that the noise from Buchwald’s power tools shatters her solitude, and his shop threatens to pave the way for more disruption as home-based businesses invade residential neighborhoods. “Simply stated, a growing commercial woodworking business does not belong in a low-density residential neighborhood,” she wrote in a statement to Seven Days. Headrick declined requests to be interviewed for this story in person or over the phone. This imbroglio has ensnared city officials, lawyers and neighbors. Last month, it landed in the environmental division of Vermont Superior Court, where the city plans to defend its decision to let Buchwald work where he lives. Adam Buchwald looks the part of a banjo-playing dad back in Vermont after a stint playing music in Brooklyn: plaid shirt, dark-frame glasses, well-groomed beard. The stately colonial house he and his wife purchased between Maple and Cliff streets is located in a “residential, low-density” zoning district, which means he had to secure a special permit from the DRB to work out of his home. He got it — back in 2012 — but at least one Queen City citizen has never accepted the decision. Sitting on a stool in his 360-square-foot garage-turned-woodshop, Buchwald ticks off the long list of Headrick’s complaints and demands, ranging from her critique of his design for new garage doors to a request that he use power tools for no more than 20 minutes at a time. He says Headrick went so far as to photograph him as he poured the concrete for his garage floor. The workshop still looks like an ordinary garage from the outside; that was a requirement of his permit. Inside, chisels and clamps adorn the walls; scraps of Sitka spruce and coils of maple binding have accumulated in the corners. And then, positioned throughout the garage, there are the power tools: router, disk sander, spindle sander, band saw, table saw — the tools of Buchwald’s trade are the targets of Headrick’s animus. Headrick and her husband bought their green-shuttered colonial in 2004, according to Burlington property records. She estimates that she hears the noise for between one and eight hours every day of the workweek. Buchwald disputes her claim of extended power tool use, saying that he uses handheld tools for 90 percent of his work. He adds that since he insulated his garage with blown-in foam and the windows don’t open, it’s unlikely Headrick hears anything at all. To make his point, he flicks on his table saw, which makes a low gurgling sound like a sink’s garbage disposal. Headrick rejected a request to visit her sunroom so a reporter could listen to the noise she describes. As an alternative, she suggested a visit to the Buchwalds’ kitchen, which she said is roughly the same distance from the garage as her house. One day last week, a reporter did just that. Inside his workshop, Buchwald revved up several tools, including what he said was the loudest combination of equipment: a dust collector and a band saw. Listening from inside the kitchen, the reporter heard: nothing. The feud between Buchwald and Headrick began in July 2012, before Adam and Sarah Buchwald had even closed on their house. 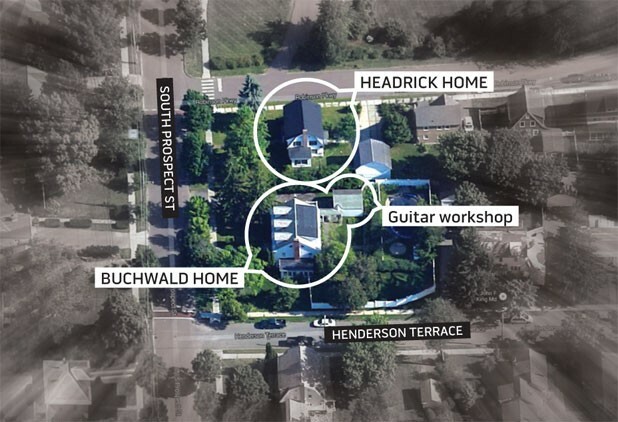 After learning of Buchwald’s plans to build and repair stringed instruments in his garage, Headrick emailed zoning officials with a long list of concerns. By early August, she had spent $500 to appeal Buchwald’s permit, according to emails between Headrick and zoning officials on file at city hall. The first hearing before the DRB took place September 4, 2012. A video recording of the session shows Buchwald providing a matter-of-fact description of the work he would do inside his garage, indicating it was not likely to disturb neighbors. Headrick came with a lawyer and a thorough knowledge of city ordinances. She had also read up on guitar making — at one point, she listed typical voltage levels for the power tools commonly used by luthiers. Her attorney, John Gravel, alleged that Adam Buchwald was running afoul of the zoning ordinance in numerous ways. “It is a leap of faith to say that those sounds won’t emanate,” he told the board. He also warned that the luthier’s work put Headrick’s house at risk of fire. After considering those objections, the DRB approved Buchwald’s permit application on September 13, noting that his plans were “low key in nature and will result in no adverse impacts on the character of the area.” In the “Findings of Fact” filed at city hall, the board spelled out why the application met each condition that applies to this type of zoning permit. Standard conditions required, among other things, that there be no exterior evidence of the shop, no noise that would bother neighbors and no more than one additional vehicle on the premises. The board did, however, ask Buchwald to submit a list of his tools to the fire marshal for review. Headrick appealed the decision to the DRB without success. The following summer, she alerted a code enforcement official to two alleged violations: She said Buchwald had been using his entire garage to build his guitars, despite having told the DRB that he would only need half of it. And customers had started coming to his house, which also hadn’t been stipulated in his application. After a visit from city regulators, Buchwald found himself in front of the DRB again, this time seeking permission to change his permit to allow customers to come to the premises and to enable him to use the entire garage for his work. Buchwald said he didn’t realize he had transgressed the bounds of his permit. Board members granted Buchwald’s request for an expanded permit. A customer car in his driveway would not significantly increase neighborhood traffic, the DRB ruled, and using the entire garage would be fine. The zoning ordinance states that a home occupation can take up no more than 35 percent of a dwelling; Buchwald’s garage represents 9 percent of his home at 292 South Prospect. Headrick is challenging that decision in Superior Court, with an initial conference scheduled for February 24. She’s asking a judge to consider a number of objections in addition to the noise levels. Her main concerns, outlined in a “Statement of Questions” submitted to the court, are increased traffic from customers, which she says disturbs her privacy, and the workshop’s impact on the character of the neighborhood. “Part of the price we paid for our homes was to be able to enjoy this particular quality of life, a quality which the Burlington Zoning Ordinance was designed, in part, to preserve,” she stated in an email to Seven Days. The Headricks paid $395,200 for their South Prospect Street home in 2004. Eight years later, the Buchwalds paid almost twice that — $766,000 — for the place next door. In a neighborhood with generally spacious lawns, Headrick lives closer to the Buchwalds than other neighbors — within 35 feet, according to her measurements — and she is the only one to have sought official recourse through the DRB. But she’s not alone in voicing concerns that Buchwald’s workshop could open the floodgates to more home-based businesses and alter the character of the neighborhood. Eighteen people signed a petition she circulated before Buchwald moved in, opposing the approval of a “commercial woodworking business” in their midst. At least some opinions may have shifted in Buchwald’s favor now that he’s moved in and begun work. None of a random sampling of nearby residents — including one of the petition signatories and another neighbor who initially had concerns — said they would characterize Adam’s shop as “commercial.” Two neighbors, who didn’t want their names published, said they thought Buchwald’s shop created a dangerous precedent, but they also said they hadn’t seen any evidence of it disrupting the neighborhood. The couple is equally surprised they haven’t been targeted. Their home, for instance, has generated noise — but no complaints from Headrick. “I like to paint, and during the summer I’ll have the windows open, and I have put on Led Zeppelin on occasion, and she’s never said anything,” Jan Stickle said. For Buchwald, the situation is awash in irony. His house is near UVM, his alma mater and a place where students make plenty of noise. “There are frat houses all over. People are drunk every night, throwing beer bottles on your lawn,” Buchwald said. Other neighbors confirm that drunk and screaming college kids are a regular feature of life there, and some have raised complaints, along with Headrick, about the noise and traffic volume generated by UVM buses negotiating South Prospect. Buchwald said it strikes him as strange that he made it through college without getting a noise violation — only to become a target after returning to Burlington as a married father of two with a stable livelihood. Only a tiny percentage of complaints to city zoning officials make their way beyond the administrative process and into Vermont Superior Court. During fiscal year 2013, four of the 1,320 decisions made by the DRB ended up on the court docket. bobstannard: Wondering if this knowyourassumptions guy has ever been to the Vt State House.